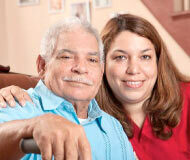 RN Kika Garcia-Awan’s care at home helped José S. recover from a stroke. Effective November 9, 2012, please enter your employee ID number, located on the lower left corner of your employee badge and on your paystub (not your hyphenated BEARS ID), as your user name. Please contact the help desk at 215-757-9000 (Monday through Friday from 8:30 am to 5:00 pm EST) if you should have any problems. © BAYADA Home Health Care, 2014. All Rights Reserved.